When Adam Goodes performed his controversial “war dance”, in celebration of the Sydney Swans’ victory over Carlton earlier this year, what most Australians didn’t realise what that he was enacting real Australian culture dating back thousands of years. 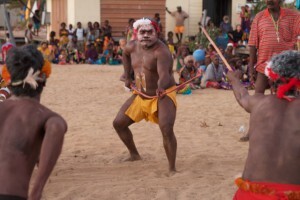 Through his in-depth research with Indigenous tribes in the Northern Territory, author and cross-cultural facilitator Richard Trudgen (Finalist, NT Senior Australian of the Year 2015) reveals how Adam Goodes’ “war dance” is in fact the same ceremonial act as what the Yolngu of Arnhem Land refer to as “balyunmirr”, which has parallels with the haka in New Zealand. Richard says, “We could be giving the New Zealanders their haka and then some, if Australians only knew their real cultural roots”. This concept of balyunmirr is one that has remained unknown outside of Arnhem Land, until now. There is no equivalent word for the term in English. They are performed at prescribed times of great celebration, such as at official ceremonies, funerals, or when opening and closing different chambers of traditional law. Yolngu may also balyunmirr to create legal sanctuary, like a safe house or embassy for family members under threat. And it is also used when welcoming outsiders to their traditional estates, as a statement of jurisdictional authority. It can be said that balyunmirr is the original Welcome to Country ceremony. Sometimes a Yolngu person will play just the rhythm and the words in their heads to encourage themselves in times of self-doubt or extreme trial. At other times Yolngu act out a part of the steps/dance and sing the words to give courage to themselves and their colleagues, as they prepare to take on a public challenge or defend their homes or themselves. Similar to “giving strength to the arm” or, in the way the New Zealand haka is performed before a rugby game, to show the other side that, “We/I cannot be beaten”. It’s also used as Adam Goodes used it; to celebrate a victory. Many Yolngu people see clear cultural similarities between their balyunmirr performances and some contemporary cultural activities, which can help us understand balyunmirr. This includes the mainstream Guard of Honour ceremonies. Richard Trudgen has lived and worked with the Yolngu peoples of Arnhem Land for the last 40 years. He is a veteran community educator, cross-cultural facilitator and presenter, and author of the seminal work on contemporary Indigenous Australia “Why Warriors Lie Down And Die”.